Epec (Finland) exhibited at Bauma 2019 its S-series functional safety platform. The host controller complies with SIL‑2 according to IEC 61508. 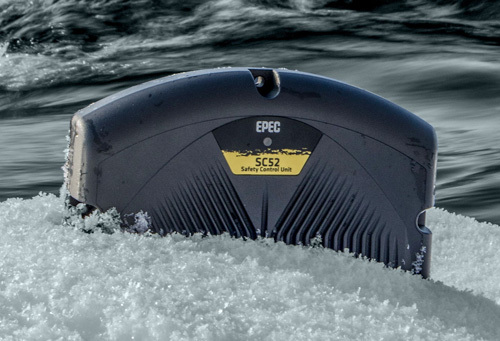 The SC52 safety controller has 14 safety inputs and 8 safety outputs. Via the CAN interface, additional CANopen safety, CANopen, or J1939 devices can be connected. The controller is programmable in Codesys Safety. The platform providing hardware, software, and pre‑certified PLCopen (IEC 61131‑3) application libraries meets SIL‑2 (IEC 61508) and PL-d (ISO 13849) requirements. The PLCopen application program memory has a capacity of 1 MiB. Since last year, the product is certified by German TÜV. Additionally, the Finish company offers a broad range of CANopen products including displays and I/O modules. Devices supporting the CAN-based Isobus (ISO 11783 series) are available, as well. The Isobus implementation is certified.